The beliefs of the Ancient Egyptians concentrated not only on their daily life but also the prospect of life after death - the afterlife, and eternal life. The Ancient Egyptians believed that death occurred when a person's life-force (ka) left their body. Ceremonies conducted by priests after death, including the "opening of the mouth' ceremony was aimed not only to restore a man's physical abilities in death, but also to release the entities known as the Ka, Ba and Akhu which were united in the afterlife. The Ancient Egyptians regarded man as composed of various different entities, or elements, each having its separate life and functions. The Ancient Egyptians believed that the Ka or double was a less solid duplicate of the body, a coloured but ethereal projection of the individual, reproducing him feature for feature. The Ka of a child was therefore as a child; the Ka of a woman was therefore as a woman; the Ka of a man was therefore as a man. 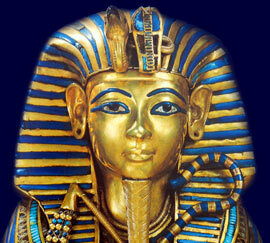 The Ka, or double, stayed in the tomb inhabiting the body (mummy) or even statues of the deceased. The Ka was believed to be independent of man and could move, eat and drink at will. The Ancient Egyptians belief that the ka was sustained through food and drink resulted in offerings of such being presented to the dead. Their beliefs were that the 'kau' within the offerings was consumed - not the physical aspect. After the Ka came the Soul ( the Ba ), which was popularly represented as a human-headed bird. The human -headed bird flew around in the tomb during the day bringing air and and food to the deceased. The Ba was able to leave the tomb and revisit the dead person's haunts in the mortal world. During the evening the human headed bird Ba joined the entourage of the Sun God Ra travelling across the heavens and at dusk descending into the underworld. Like a soul, the 'Ba' is a part of a person that lives after the body dies. After the Soul came the Akhu (Akh, Khu, Ikhu) or "the Luminous" a spark from the divine fire - a divine spark. This was the immortal part of man which emerged after the deceased passed judgement after death, and the Ka and Ba united thus creating an entity known as the Akhu (Akh, Khu, Ikhu). None of these entities, or elements, including the Ka were in their own natures imperishable. Left to themselves, they would hasten to dissolution, and the man would thus die a second time and he would be totally annihilated. The piety of the survivors found means, however, to avert this terrible catastrophe and the loss of the Ka. By the process of embalmment, they could for ages suspend the decomposition of the body; while by means of prayer and offerings, they saved the Ka, the Soul, and the "Luminous" from the second death, and secured to them all that was necessary for the prolongation of their existence. The Ka never left the place where the mummy reposed: but the Soul and the Akhu embarked on a journey to follow the gods. They, however, kept perpetually returning, like travellers who come home after an absence. The tomb was therefore a dwelling-house, the "Eternal House" of the dead, compared with which the houses of the living were but wayside inns; and these Eternal Houses were built after a plan which exactly corresponded to the Egyptian idea of the after-life. The Eternal House must always include the private rooms of the Soul, which were closed on the day of burial, and which no living being could enter without being guilty of sacrilege. It must also contain the reception rooms of the Ka, where priests and friends brought their wishes or their offerings; the two being connected by a passage of more or less length. The arrangement of these three parts varied according to the period, the place, the nature of the ground, and the caprice of each person. The rooms accessible to the living were frequently built above ground, and formed a separate edifice. Sometimes they were excavated in the mountain side, as well as the tomb itself. Sometimes, again, the vault where the mummy lay hidden, and the passages leading to that vault, were in one place, while the place of prayer and offering stood far off in the plain. But whatever variety there may be found as to detail and arrangement, the principle is always the same. The tomb was a dwelling, and was constructed in such a way as to best promote the well-being, and ensure the preservation, of the dead and the Ka, Ba and Ahk.